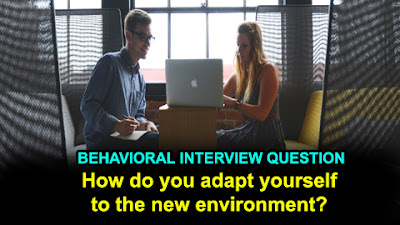 Situational Interview Questions & Sample Answer - How do you adapt yourself to the new environment? a) How long does it generally take you to settle into a new environment? b) How long do you feel it will take you to make an impact in your new job? During your job interview, you will be asked about how you adapt to change. Most of the interviewers may ask very targeted behavioral interview questions to identify how exactly you adapt to change in the workplace and in the specific role they are recruiting for. If you are applying to a fast-paced job, it may also be important for the interviewer to find out how you deal with a rapidly changing workplace. When you're answering these questions, always give a specific example that explains the situation, your actions, and the results. The interviewer wants to hear about how you handled the stress of a promotion or additional responsibilities being added to your job description. These types of examples will demonstrate that you can effectively adjust to a changing work environment. - You must always answer that you are adaptable to change and then go on to explain how. - Make sure to answer this question in a confident way and let your interviewer know that you are flexible and adaptable to change. Be careful to avoid looking nervous or unsure. - Try to backup some examples from your past experience at your work or University, but it is not necessary if you do not have a good story to tell. - Mention how your skill set makes you an ideal candidate for the position. - Focus on any skills that help you learn quickly such as problem-solving or critical thinking. - Do not give a short answer in an attempt to move on to a different question. Answer 1: Adopting to a new environment is like changing our day to day activities matching with the new environment. So, I have no issues with change. While every organization is different and no two jobs I’ve had have ever been the same, the core requirements of my role don’t change. I use my skills, talent, and experience to do the best job I can in the workplace. I try to collaborate with the whole team through good communication and teamwork. I am confident in my ability to adjust my actions or behaviors as needed, and consider myself adaptable to all situations – not just change.